When you book a pony ride party in NY, the children will be enchanted by riding and petting these gentle creatures. We’ve compiled a guide to the best pony parties in NY. Browse our list to find pony ride parties that come to you, as well as stables and barns that offer birthday parties for kids. KidsParties.Party also lists pony parties in NY by city and county. Kids will be delighted learning about and interacting with beautiful horses. Ride and play with ponies in the heart of Manhattan! Join us at Chateau Stables, in the heart of Manhattan, for some unique fun for all ages! Visit a historical, active, working horse stable in Manhattan NY. Take a tour of the facility, pet, brush and play with the horses and ponies. 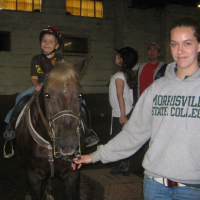 We have walk-up pony rides available all Saturdays and Sundays throughout the year. 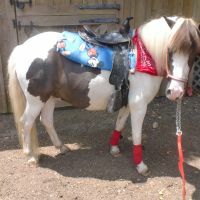 We have ponies and horses suitable for all ages and sizes, even adults can ride! We are a venue for themed pony birthday parties, or we can bring a decorated pony to your location for a party, store opening, business function, restaurant, or just about anything else you could imagine. Enchant your friends and children with our clean and friendly ponies in our unique urban setting. Pony Rides at Home or in a Stable in NY! 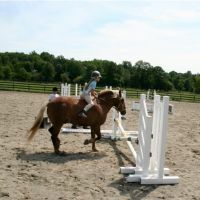 Give your kid the wonderful gift of holding a pony riding party in NY at the Bronx Equestrian Center. Offering two-hour party room and area rentals, this NY pony party venue is the perfect spot for your kid and guests. You are also given the option of taking a trail ride or a hay ride, which the children will love. If you don't have a big group, feel free to stop by a take a pony ride any day of the week, all year round. Whether you want to have your NY pony party at your home or at the stable, Bronx Equestrian Center will accommodate our wants and needs. 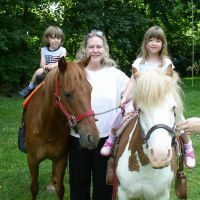 Pony Rides that will come to you in NY! Don't worry about driving out of the city to get to a good quality pony party in NY - Pied Piper Pony Rides will come to you! They are willing to come to any location, from your home to a museum, and for any event, from a birthday party to a wedding. Not only do they offer pony rides, but they also offer a petting zoo that can also come to your location. With the friendly staff, the vast variety of animals from big to small, the hands-on animal experience, and the affordable cost, it is no wonder that Pied Piper Pony Rides is one of New York's greatest pony riding party services. 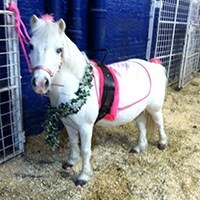 Pony Rides offered by this Party Entertainer in NY! 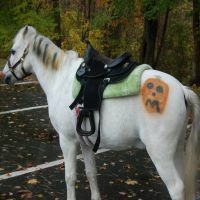 Don't let the name mislead you - Clown Magic does not only offer clown appearances, but also pony rides in NY! Guaranteed to be a hit with kids, Clown Magic's pony rides offers two ponies to ensure a fun-filled birthday party experience. Also offered is the exclusive pony-go-round, which entails four, six or eight ponies that will give the children a real-life merry-go-round experience. Also consider Clown Magic's various party packages, including the "Clown and Pony," and the petting zoo. 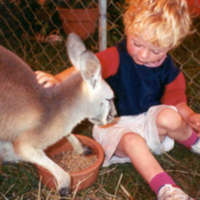 Not only will the children get a chance to ride a pony, but they can also pet a zebra and a kangaroo, and take a ride on a camel. 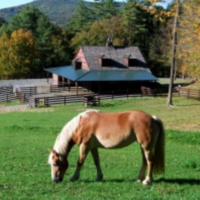 Pony Rides & Party Accommodations in NY! Whether you're looking to entertain a large party, or just a few close family and friends for your child's birthday, Lynne's Riding School has everything you could ever want. No matter what type of weather, this pony riding stable in NY is a perfect spot to host a fun and entertaining kid's birthday party. With three horses or ponies and handlers, as well as a private party room, Lynne's Riding School has the finest accommodations for your kid's party. Adults can even have some fun too by taking a horse ride around the ring with the kids! A Hassle-Free Pony Party Service in NY! 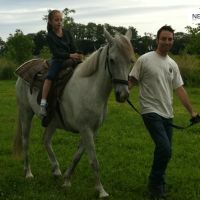 This pony riding party service is located in New Jersey, but serves New York. Ponies for our Party will come to your house or any other requested location, and promise some clean, professional and safe fun for your kid's birthday party. Offering two ponies for either a half hour or an hour, Ponies for your Party makes accommodations according to your wants and needs. Not only do they do birthday parties, but they also do fairs, carnivals, church events, and more. Ponies for your Party ensures that your children will love it, and you will love the stress- and hassle-free party set up and clean up. Memories of a Lifetime for Your Child! Lollipop Pony Parties is a Long Island family run farm where ponies ride along goats, sheep, rabbits, chickens, duck and a llama. The owners live there and take care of the animals. The parties are held outside the farm, at any place you pick - your yard, churches, parks, schools, etc. 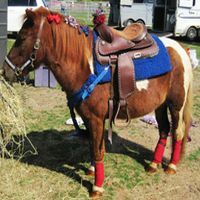 Ponies are dressed up in princess and cowboy styles according to your preference. Children will be excited to meet the ponies and to take a ride on them or in the small carriages crafted especially for them. 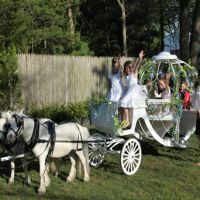 Started in 2013, Lollipop Pony Parties introduced a Princess Carriage, built by the manufacturer of the Disney Carriages! Let your girl make a grand entrance at her birthday party! The New York Equestrian Center has a 90 year tradition in horse breeding. In 2012, former Lakewood Stables has been refurbished and now has a new look and a new name. The facility is very modern, has a huge arena for horse and pony rides, and luxurious stalls. 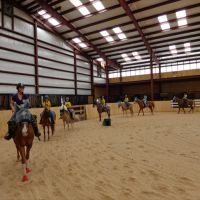 The center offers riding lessons with certified instructors (group or private), trail rides, summer camp and after school, pony parties for up to 100 people. If you want a private pony party at your house, it can also be arranged. Get ready to give your child a fun party he/she will never forget! Everything a horse lover wants! Summit Farm is a full service stable located in North Salem, only an hour away from the busy New York City. 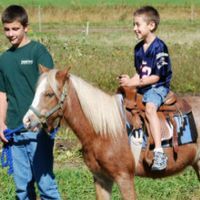 They offer riding lessons, summer camps, boarding, sales, leasing, showing and of course, the popular pony parties which every kid wants for his/her birthday. The newly refurbished farm has indoor and outdoor riding arenas, so you'll have your party no matter how bad the weather is. Parties are held on weekends and last for 2 hours. Prices start at $550 and include a barn tour, pony rides, pizza, horseshoe decorations and a meet and greet with the friendly staff. A fifth generation family farm, now a modern petting zoo and party facility for kids, White Post Farms has been winning the hearts of Long Islanders for many years. It's been voted no. 1 petting zoo in Long Island and has had appearances on NBC 4, Fox 5, TV55, News 12, The Today Show, The Daily News and The New York Times. So, what are you waiting for? Come see the animals! The ponies are just a small part of the attraction. Pony parties are accompanied by a pizza party in a special room, beautifully decorated. After that, the kids get to feed and pet the animals. The adults can enjoy a good meal, too - there are many assorted platters available for groups, made with fresh products from the farm market. Here, at this lovely farm in New York, you can feel the love all around you! Many of the animals who live here were either rescued or rehabilitated and they are very well taken care of by the friendly staff. They are vaccinated and under constant veterinary supervision. 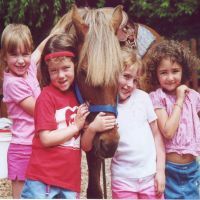 Pony parties are available in 3 packages, starting at $225 for unlimited rides within an hour for up to 20 children. You can choose a simple pony party, or a whole petting zoo with bunnies, ducks, lambs, goats, and chickens. Packages may also include face painting and party favors for all the kids. Located outside New York, the Washington Stables are a short drive from the Big Apple. Take your family and come enjoy a great day at the stables! 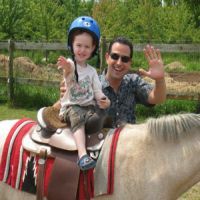 For Saturdays and Sundays no reservation is required for pony rides. Just call for opening hours and open/closed status (they depend on the weather). For pony parties call for a reservation. They have parties with 2-5 ponies and you can bring your own food. Pizza is available locally and you can rent the picnic area for $25/hour. Adults can have their own share of fun riding horses on the beautiful, natural wooded trails. A Place for the Horse Lovers! 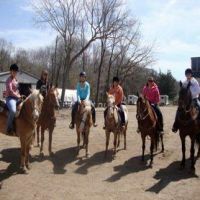 Located in beautiful scenery, in the middle of West Hills County Park, Sweet Hills Stables serves Long Island and has plenty of fun activities for horse loving children. They will love the indoor riding arena and the three outdoor riding rings where they can have private or group riding lessons. 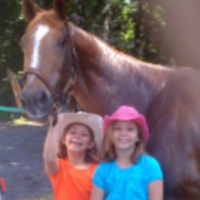 For the summertime, Sweet Hills organizes riding camps for children 6-14 years. If you want a really special party for your little one, bring him/her a pony right to your house! The prices vary upon location and how many ponies you want to invite. Best Pals in the World! Pony and Pals is a family run farm in Monmouth County which serves New Jersey and the Staten Island areas. They bring the party to you! Champion blood line ponies, race horses, a mini horse the size of a dog, chickens, goats, lambs, and bunnies are all very friendly and can be rented by the hour for your child's next birthday. The pony parties are available as such, or as part of the petting zoo. Prices vary depending on location of the party, the number of hours and the amount of ponies. The party can be set up in a garage, a patio, a deck, or in similar locations you have available. You can save up to $50 when booking online. Best Petting Zoo in Long Island! Voted The Best Petting Zoo by LongIslandPress.com in 2012 and 2013, Steppin' Out Ponies made their appearance on festivals like Long Island Huntington Fall Festival, Baldwin Festival, Schmitt Farms Fall Festival, and many others. Check out their website to see them on News 12! They could be at your house for your kids' next birthday party if you want to make it a special one. 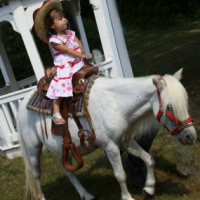 The ponies of Steppin' Out Ponies come in all sizes, so children of all ages can enjoy a ride. Harley, Cowboy, Henry, Prince Charming, Jazz and Randy can't wait to be ridden, pet, tickled and also to kiss the kids. Tell your kid to have a peppermint for Henry, he loves them. Little friends for your little ones! Little Red Barn or Jamesport Saddle Club is a 40 acre animal farm in Jamesport, NY, which specializes in pony parties and petting zoos. The parties can be held on premises or at your location. The prices start at $200 for one hour and up to 10 kids and $50 for an extra half hour at the farm and $250 / $50 at your house. There are also packages for bigger parties - check out the website for more information. 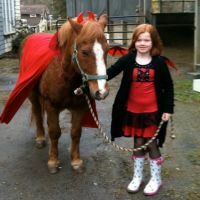 You can take your children for riding lessons (with ponies or horses) at the Little Red Barn, also. The instructors are very patient with the kids and the animals are friendly. Special needs kids are very welcome here. Baiting Hollow Farm Vineyard in New York is the property of a man deeply in love with the land and the animals. Enter the website and read the beautiful story of 85 year old Sam, who pursued his dream of having a farm and is now offering good wines and great parties for families who share his love for horses. While the adults enjoy a good meal accompanied by delicious wines from the Baiting Hollow Vineyard, the children can have a great pony party with unlimited rides and craft & cowboy hats for every child invited. One hour drive from New York, Horse Sleigh Farm prepares great pony parties for your kids. They'll get to ride, groom and feed the lovely ponies, and after that, they can eat pizza or cake (provided you want to bring some) in the pony party room. The room is nicely decorated in cowboy style and has lots of games children can play. The farm has many other fun activities for the whole family: pumpkin picking, hayrides, a petting zoo, horse drawn wagon rides, gem mining and many many others. Use the online booking calendar to find an available date for your party. Fun Fun Fun with the Animals! Whether you want a pony party at your location or at the farm, Mountainside Stables can provide both. The farm houses 10 ponies of all sizes. The pony parties at the premises last for 2 hours and adds up to the exciting and fun pony rides and attractions like the petting zoo, moon bounce and the use of the party room. Feel free to decorate the room and bring food for the kids. The farm can supply pizza and cake for an additional cost. The traveling pony party and petting zoo can move all around New York at your convenience. Pony Parties and Pizza, what can be more fun? 30 miles from NYC, Seaton Hackney Stables aka PonyShare has been offering pony parties and riding experiences for 25 years to children from 3 - 13 years. The pony parties can be held at the stables or at your location, anywhere in New York. For the safety and full accommodation of the kids, they will have a hostess and a helper who will be with them during the party. They kids will get unlimited pony rides and mini cart rides, complimentary pizza and drinks. If you want to bring a cake, a 15-20 minute space will be reserved for serving. Hurry up and book your date, they accommodate only 2 parties / day.